I'm giddy with excitement for tomorrow! Each year, I enjoy Halloween more & more. I love the planning & executing of the costumes. 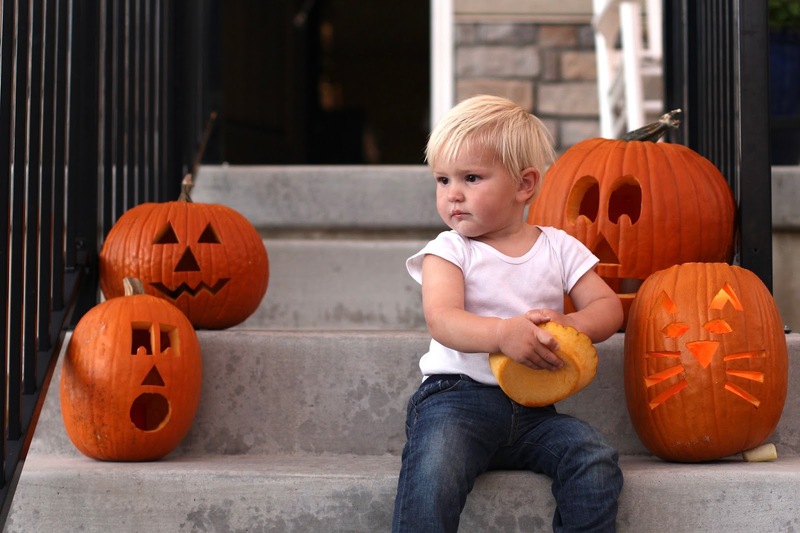 I love babies learning how to say "trick-or-treat" for the first time. I love the massive amounts of candy every where, for me... not the kids. I love the crispness of the weather, and the very last few leaves falling off the trees. So yeah, pumped for tomorrow. Especially Liam's little Halloween program at school. As per tradition, tonight we carved pumpkins. I have always loved doing them the night before Halloween, so that they are still fresh for the actual holiday. 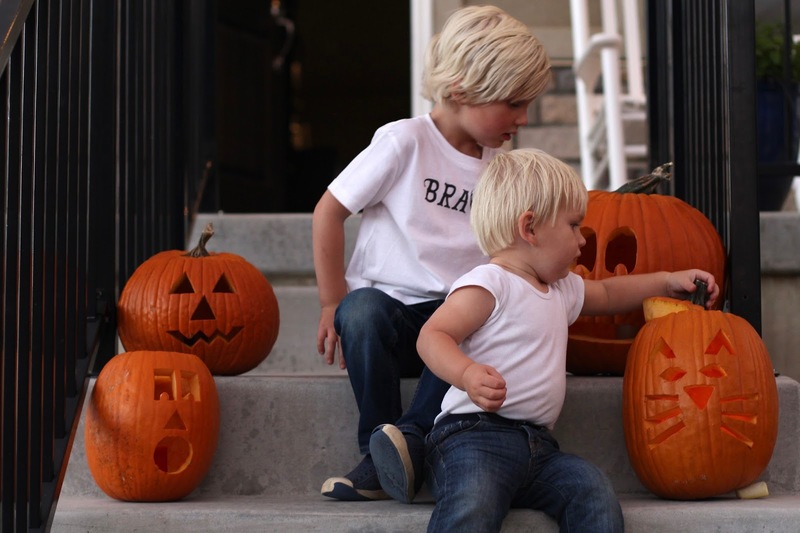 While Liam really wanted to carve his own, he still allowed Conor to have knife duties this year. 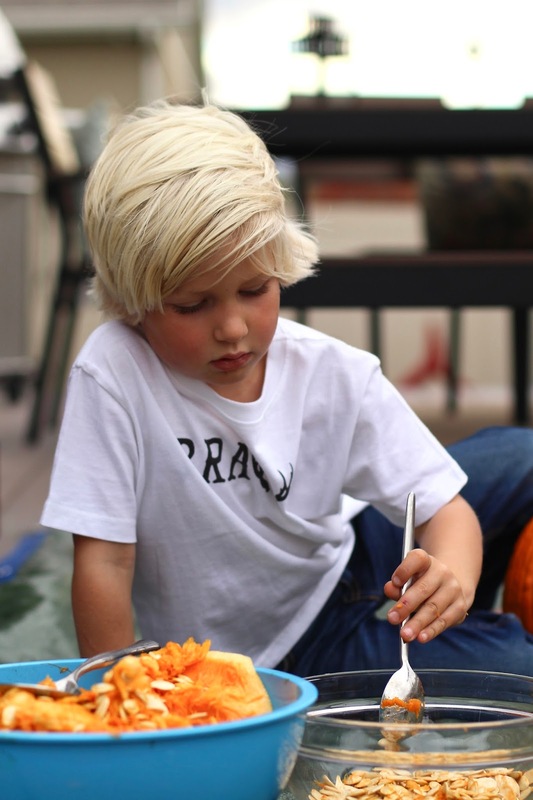 But he did attempt to draw his own face on his pumpkin, and it was the cutest set of scribbles I ever did see. While the boys pulled the "goop" out, I sifted through it all to find the seeds. I love roasting them just like my mom always did. Except I add Worcestershire, a necessary ingredient! Liam didn't want to get overly messy by any means, and Finn was content to just play with the tops of the pumpkins and move them all around. While the kitty cat was my personal design, I'm pretty sure it was Finn's favorite. My carving skills are no good, so I handed it off to Conor after a good 10 minute effort. I'll stick with roasting, that I am amazing at! Fun was had by all. The boys are asleep in some festive jammies. And I'm sure we'll be eating candy for breakfast! Happy Halloween everyone! Oh how fun! I love the faces you all chose to carve ♥ Happy Halloween! So cute! We carved our pumpkins today too. Owen doesn't want to touch the insides and prefers sawing away at the tops while we do his fancy carving ;) Happy Halloween! 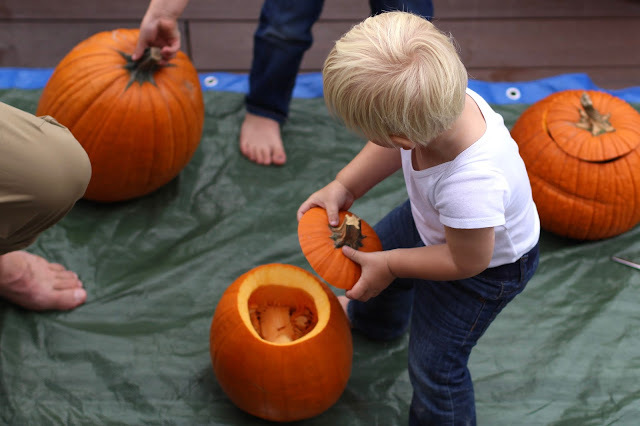 You make carving pumpkins look magical! And Worcestershire sauce on pumpkin seeds?! I need your recipe!! 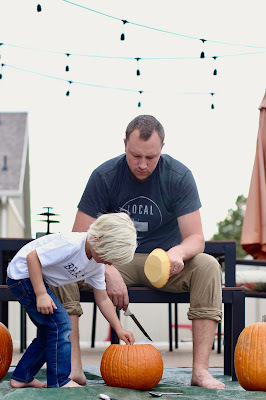 Carving pumpkins is so much fun and something I love doing as a tradition as well. Course I did all the work other than Cam helping draw the face. But I'm cool with that. Eventually they wont' want my help. Love all of your pumpkins. Your pumpkins turned out so good!!! I bought some super big ones this year and had the hardest time carving them. They were extra thick or something. And I made the mistake of trying to do it alone while Seth was at work. Oh well, there's always next year. Hope you guys have a great Halloween today! They turned out so great! We carved another one last night too, and it was so much fun! The boys look like they were mesmerized. We love the pumpkin seeds too. Best part! aww they turned out fabulously! 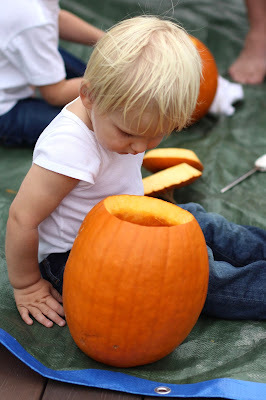 one day i will carve a pumpkin i think. not well, i am sure, but still. one day. i can't wait to have kids to take trick or treating. i never went, obviously, but i love handing candy out to the kids in the neighbourhood, it's so fun to see them having so much fun. I love all of your little traditions and plan on stealing them - next year we'll be carving pumpkins the day before, too ha! Happy Halloween!!! So fun. 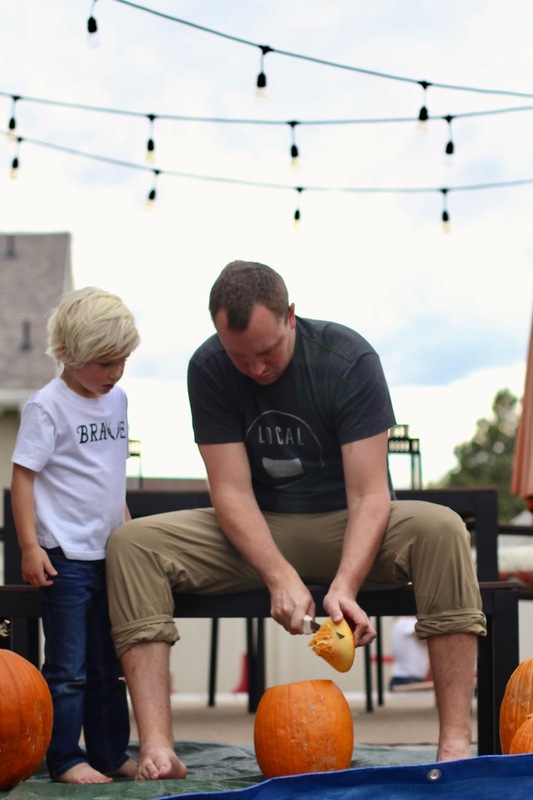 We didn't get a chance to carve pumpkins this Halloween, but we finally had a chance to go pumpkin picking this weekend. (Too many events in Oct.!) What a great Halloween tradition for your boys to remember each year. I love it! Oh fun! 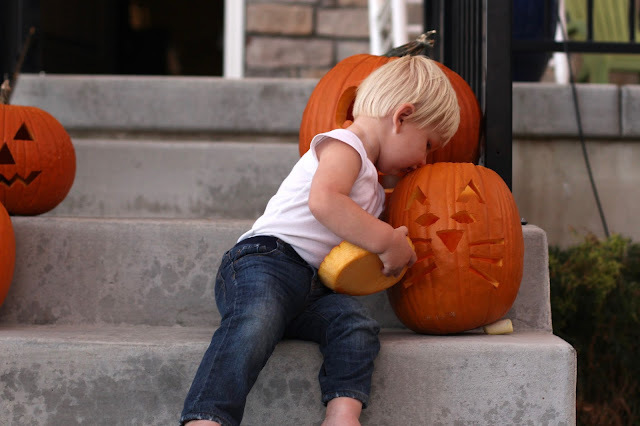 I love that you each a pumpkin. And I love your kitty! I almost carved a kitty this year, but didn't and after I didn't was a little bit sad about that decision. Maybe next year. And pumpkin seeds are so good! 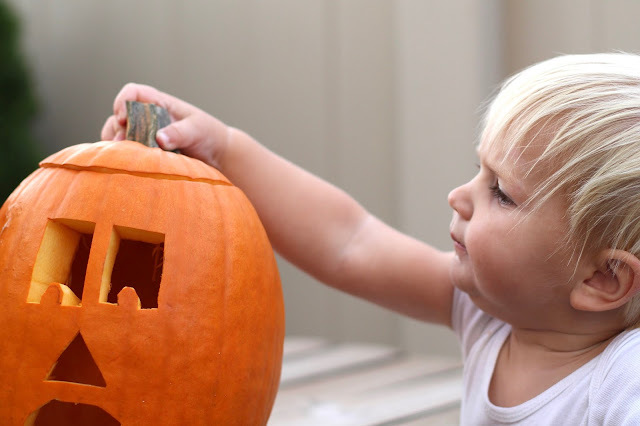 I love your pumpkin carving pictures! I really need to get on the carving the pumpkins outside bandwagon! Great job on the pumpkin carving! 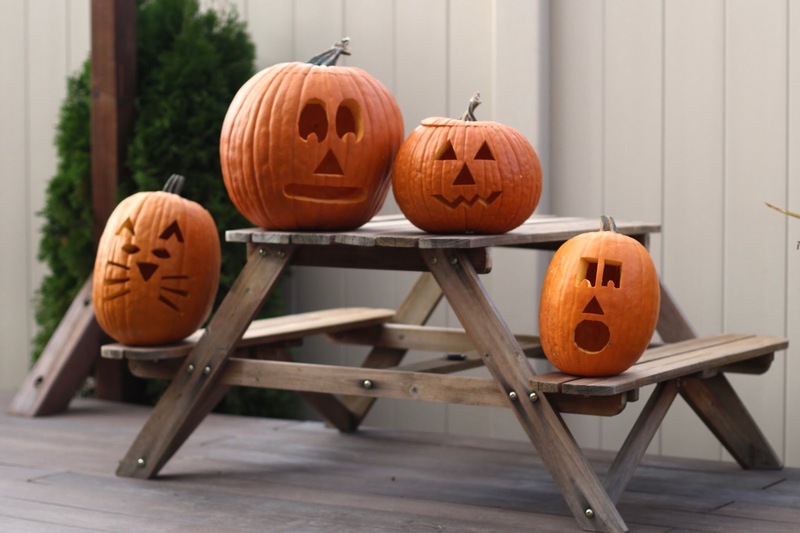 Your pumpkins look great and the pictures are adorable! 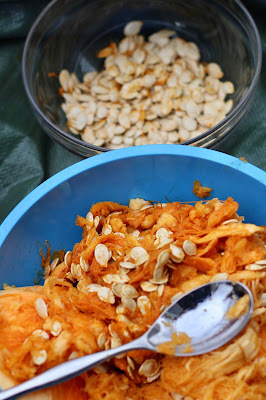 I've never tried roasting the pumpkin seeds, but I want to sometime. This year, was hands down, the most fun Halloween. I wish I could have bottled last night up and held onto it forever. I adored your costumes (nailed it), and those pumpkins turned out great! Here's to a great Halloween!! Such cute pumpkins! Love your kitty too! They look great, I love the idea of doing them the night before. A pumpkin for each of you, I'm impressed!! You had plenty of seeds to roast then. :) I found a few recipes that said boil the seeds before roasting so I tried that this year and it made for great crispiness. I always roast seeds too and what would seeds be without worchester?! NOTHING!! And us too dd them the night before! So fun! We did our pumpkins the night before too! Mac was way more into it than I expected him to be and I'm shocked no one got stabbed or lost a finger. However, we did turn our backs for a minute and the dog ate an obscene amount of pumpkin goo and then threw it up. It's always something at our house.